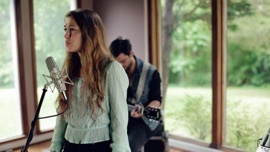 This is my favorite Lauren Daigle song. It speaks to me on a deep heart level. This girl has a ton of talent.The song is a great song and is filmed in a beautiful place. Watching her on Idol, and then coming to see new music and seeing her name makes me happy! The lyrics are inspiring, her voice is of the Angels, and I have used this song to minister to others! Lauren is amazing! Don't let the recognition get to your head though. God bless. A great performance of an amazing and powerful song! I heard this song play on KLove while driving to work. I immediately purchased it. Lauren you've been an inspiration to me. This song has blessed me and helped me refocus on GOD, HIS love, HIS grace and HIS mercy. My nephew passed away on Tuesday, 1/26/16. He was 9 and had leukemia. This song has given me so much comfort. When you sing the lyrics, truth is you know what tomorrow brings, there's not a day ahead that you have not seen; I'm comforted. Thank you from the bottom of my heart for singing and writing songs that ministers and encourages a relationship with JESUS/GOD. Blessings always. My very young staff motivated me to attend a DRIVE Conference at North Point. That’ where I first heard Lauren singing with a powerful voice and incredible lyrics. It’s been a while since I connected with today’s Christian Contemporary Music but this young lady helped me bridge the gap. She’s a favorite on my Sirius and when our Team sings her songs I can sing along too. Just goes to show you - when God gives someone a gift everyone can be touched - even 50 year old Pastors like me. Love this song too! Keep ‘em coming. We’ll worship with you anytime. Struggling hard right not - work issues, money, maybe a new relationship (my first post-divorce), and now my cancer has returned. I was all wrapped up in my swirlling thoughts on my way to work when this song came on. I pulled over two blocks short and cried. When it was over, my head was clear and calm, and I told God, "As you wish and have planned for me, I can only trust in you." THIS SONG lifted the clouds so I could take in and refocus on God's light and grace. THANK YOU. Struggling with a love one's behaviour toward me. This song is easing the pain.